This Keystone Springdale bunkhouse travel trailer with rear garage door offers you plenty of comfortable living space, plus the rear garage allows for some fun outdoor gear. 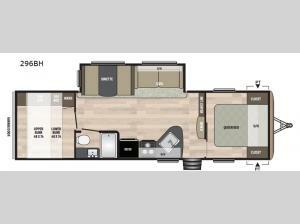 Step inside model 296BH and be pleasantly surprised at the amenities inside. You will find a spacious combined kitchen and living area with a large slide out booth dinette and jack knife sofa opposite the door. Each seating area can also double as sleeping space if needed at night. Overhead storage is conveniently located for all of your daily dishes and things. The very rear of this model features a private bunk room featuring a set of 48" x 74" bunks with a wardrobe, as well as a toy box for your things. The rear garage door makes it easy to load up your outdoor gear and other fun camping items.